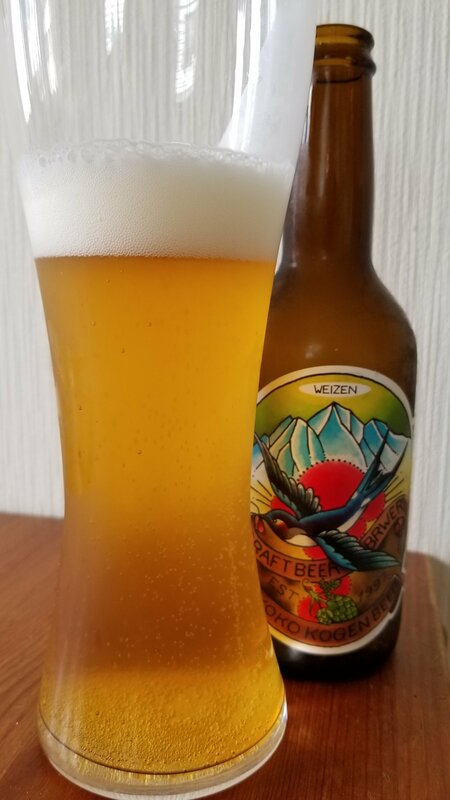 Myoko Kogen Weizen is a 5% German hefeweizen from Myoko Kogen Beer, based in Niigata, Japan. It’s part of their all-year round range and comes in two different labels – this one below and also the bog-standard regular boring label. Myoko Kogen Weizen poured out a slightly hazy golden yellow colour with a plump white head on top. Myoko Kogen Weizen had a sweet banana and clove aroma to it, along with subtle grainy wheaty aroma too. It had a light crisp lemony undertone to it once it had warmed up to room temperature too – almost like a Citra weizen. The citrus nose carried on into the body with a faint citrus kick to the banana and clove body. It’s one-dimensional after a while but it does what a hefeweizen is supposed to do. The banana and clove flavours let a slight edge of wheat come through the thicker-than-usual body. Myoko Kogen Weizen finished off with a peppery clove aftertaste that faded pretty fast from the palate. Myoko Kogen Weizen isn’t going to excite you nor push you towards drinking hefeweizens but what it does, it does well enough.